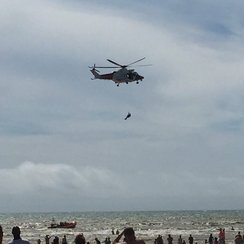 One person was taken to hospital by helicopter while another was transported by ambulance after the incident at Camber Sands, the Maritime and Coastguard Agency said. Rescue teams from Dungeness and Rye, Coastguard rescue helicopters from Lydd and Solent, Rye RNLI lifeboat, beach lifeguards and police are searching for a missing person last seen in the water. Hastings RNLI lifeboat and Pett Level Rescue Boat an independent inshore boat also joined the search. “We are saddened by the tragic incident at Camber Sands on Sunday and our thoughts are with the family and friends of the man who died and the two men who remain in hospital. “Hundreds of thousands of people enjoy Camber Sands every year and Sunday was particularly busy with around 25,000 visitors. As is usual for the summer season, beach patrols were on site to advise people of potential dangers, reunite lost children and deal with incidents on the beach. The district council's coastal officer and officers from Sussex Police were also on the beach.